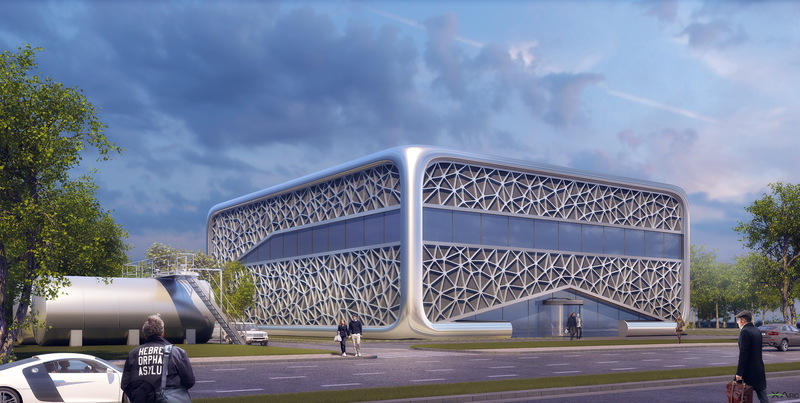 The Korea Institute for Civil Engineering and Building Technology (KICT), commissioned XArc to provide a building concept design for its Extreme Construction Research Center. KICT is a science & technology government-sponsored research institute of the Republic of Korea. The space facility research center is to be located on the KICT campus at Goyang. The building will house one of the world's largest vacuum chambers for space environment research of In-situ Resource Utilization (ISRU) technologies for planetary construction applications. (ISRU refers to the production of useful materials from the resources available at a given location, in this case lunar resources for planetary construction). The state-of-the-art vacuum chamber is designed to realize testing environments at ultralow temperatures and close to a vacuum state as well as those similar to lunar surfaces using artificial simulants. The large vacuum chamber allows for the simulation of lunar soil (regolith) environments. Known as a "Dirty Vacuum Chamber" because it contains simulated lunar regolith within the chamber for testing planetary construction methods in excavation, robotics, drilling, and 3D printed habitat technologies. KICT plans to complete its full scale vacuum chamber by the end of 2017, and intends to make the facility available to the global space exploration community.